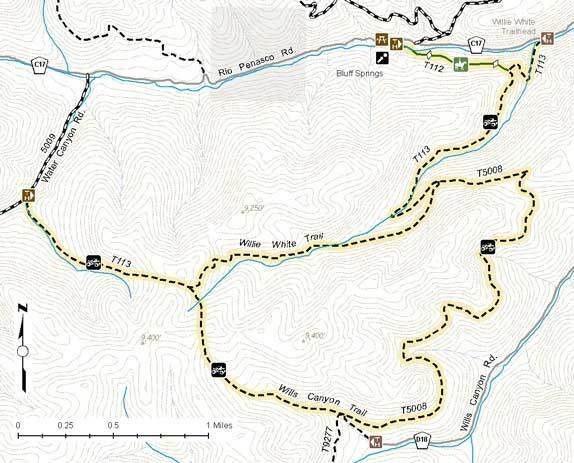 Willie White Spur Trail #112 is a 0.6 mile one way hike with 156 feet accumulated elevation gain. Located 14 miles east-southeast of Alamogordo New Mexico. March and April are the best months to enjoy this hike. It begins at Bluff Springs and ends at the Willie White trail (T113). The trail is open for the following uses: Hiking, Horseback Riding. One of our many historic railroad grades now converted into a USFS trail. Either all or most of this trail follows the old steam engine route.